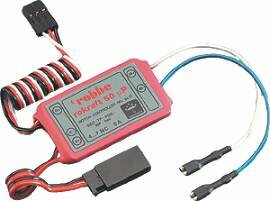 A miniature speed controller for small models and auxiliary working systems. The expanded zero point, non-linear control curve and high pulse frequency provide ultra-fine speed control. In spite of its small size this controller features comprehensive protective functions. Full forward-reverse control.